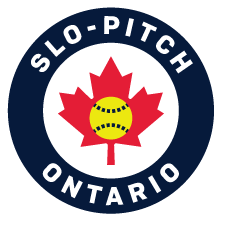 The purpose of this policy is to govern Concussion Protocol in the sport of Softball in the province of Ontario within Slo-Pitch Ontario (SPOA) and its Members sanctioned events. This policy is for all of SPOA and its membership. If members fail to comply with this policy, they may face penalties as outlined in terms of Membership. • Recent research has made it clear that a concussion can have a significant impact on a student’s cognitive and physical abilities. In fact, research shows that activities that require concentration can actually cause a student’s concussion symptoms to reappear or worsen. It is equally important to develop strategies to assist students as they “return to learn” in the classroom as it is to develop strategies to assist them “return to physical activity”. Without addressing identification and proper management, a concussion can result in permanent brain damage and in rare occasions, even death. All participants who experience any concussion signs and symptoms (see General Concussion Symptoms) following a blow the head or another part of the body is considered to have a suspected concussion and must stop participation in the softball activity. Who is responsible for removal from play? If a suspected concussion occurs, it is the responsibility of all team officials/caring adult (Coach, Manager, Trainer, Parent, Executive, Official) to remove the participant from participating in softball activity immediately. When present, a Caring Adult holds the final decision to remove participants with a suspected concussion. The Most Caring Adult should be identified prior to the activity. If there is doubt that a concussion has occurred, it is to be assumed that there has. If a participant experiences a sudden onset of any of the Red Flag Symptoms, 911 should be called immediately (see Red Flag Symptoms). All participants in a sanctioned SPOA Association activity who experience any concussion signs and symptoms following a blow to the head or another part of the body is considered to have a suspected concussion and must stop participation in SPOA activity immediately. It is important to note that symptoms can take 24-72 hours to appear. A participant does not have to be unconscious to suffer a concussion. 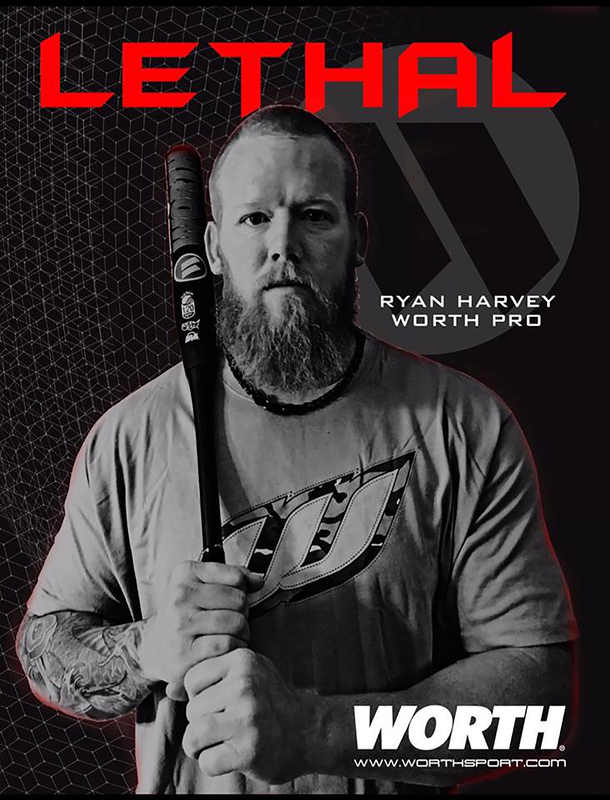 NOTE: An initial period of 24-28 hours of both relative physical rest and cognitive rest is recommended before beginning the Return to Softball Strategy. There should be at least 24 hours (or longer) for each step of progression. If any symptoms or signs worsen during exercise, the participants should go back to the previous step. Resistance training should be added only in the later stages (Stage 3 or Stage 4 at the earliest). 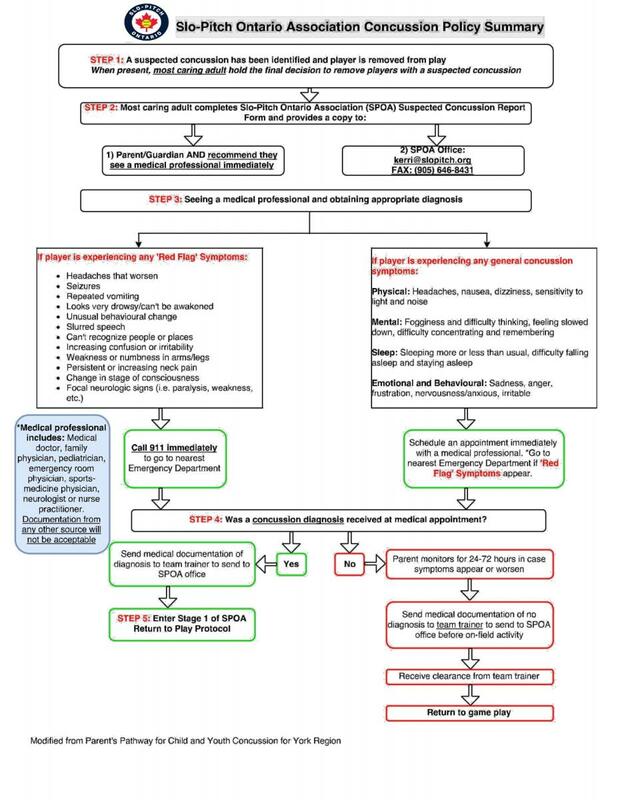 If symptoms are persistent (e.g more than 10-14 days in adults or more than 1 month in children) the participant should be referred to a healthcare professional (as identified) who is an expert in the management of concussion. For a participant to progress to Step 4 written documentation is required from a medical doctor or a nurse practitioner indicating that the participant is able to return to Step 5, full game and practice performance mode. 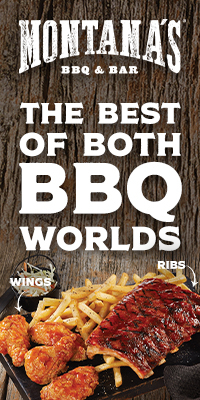 Parent/Guardian is responsible for providing this to the applicable Softball Association. All relevant Softball Ontario stakeholders (including but not limited to Coaches, Managers, Trainers, Umpires and Convenor) will be trained annually, and before the commencement of the softball season, on SPOA’s Concussion Policy, specific roles and responsibilities and updated according to the policy revisions. SPOA will provide a form template for members to track injury incidence. Members are responsible for monitoring injury incidence and developing strategies to reduce their injury in their sanctioned events. 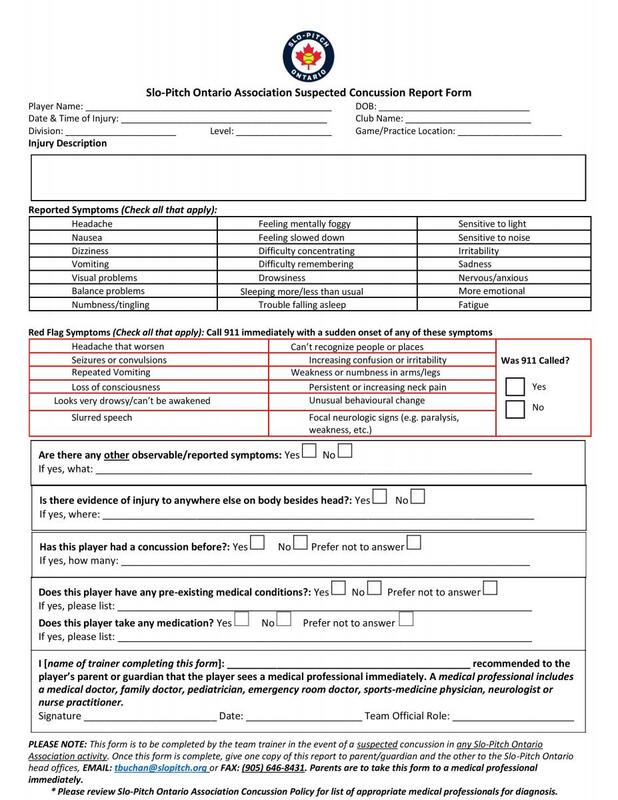 Members are responsible for maintaining records of reported concussion injuries and documentation of Participant diagnosis and clearance to return to play. SPOA will conduct a review of this policy every 4 years. A Committee comprised of Softball Ontario and Member Association representatives and external concussion expertise will review current evidence and policy effectiveness in identifying concussion, training stakeholders and tracking injury and managing documentation of injury and return to play. 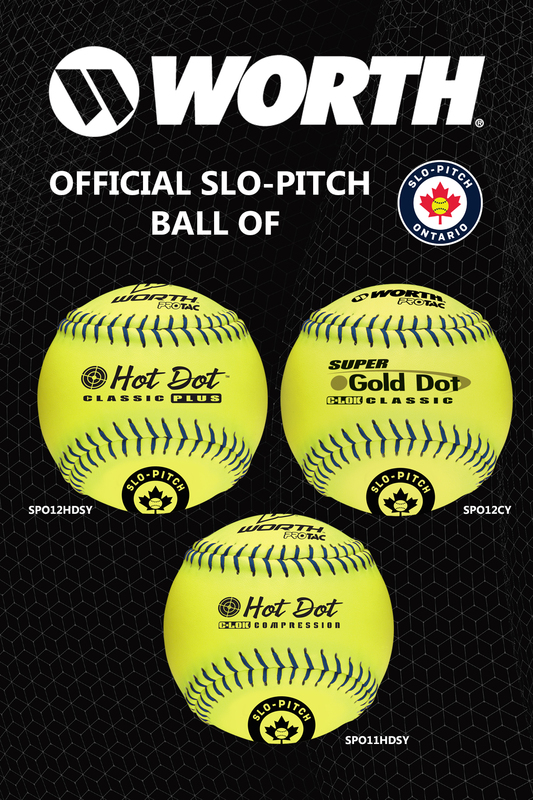 A recommendation to the Softball Ontario Board of Directors will be made to maintain, change or abolish this policy.